What do you get when you help out your friends? You get FREE LUNCH! Since I don’t like to spend my lunch break at my usual lunch place, Jollibee, Mcdo and KFC, I asked my friend to treat me at Army Navy. FYI: I booked her flights for 15 passengers using my Aunt’s credit card, so I asked her to treat me for that (lagi na lang akong nagbobook, di man lang ako ilibre – drama mode)! Best Bite Begins Here. Army Navy was first established at Tagaytay City and then opened its branches here at the Metro. The store was designed as a quonset hut which makes Army Navy different from the others. And the food? Let’s check it out! First food served, the Classic Burger. The burger cost PHP 135.00, classic single quarter-pound beef patty, topped with fresh crispy lettuce, tomato slice & onions, mayo & ketchup on toasted sesame seed kaiser bun. It was really good! I wanted some more but we still have foods to eat on our table! If you want some triple quarter-pound natural beef patties, then try their famous Bully Burger that cost PHP 235.00. Burger is perfectly great if there’s fries on the side. Freedom fries costs PHP 60.00 and it was seasoned, thin-cut, crispy, zesty fries. So how’s the Army Navy’s Freedom Fries? It’s freedom. I liked it! It’s crispy and a bit spicy. No additional fee for mayonnaise, great! Our other friend, ordered steak soft tacos but the order turned out to be wrong. The food served was steak quesadilla (yun din nakalagay sa reciept). Instead of complaining, we just deal with it and ate it! The steak quesadilla is a folded tortilla filled with meat, onions and cilantro and served with salsa. Do we still have space for the burritos? Yes! The Steak Burritos costs PHP 155.00 and it is flour tortilla filled with meat, spanish rice, beans, onions, lettuce and cilantro. Served with salsa and a slice of lime. All meals should come with a great drink (panulak), so let’s have Libertea Iced tea! 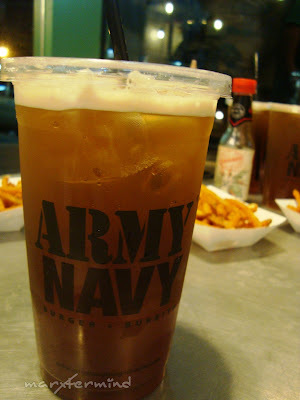 It was a full and satiated dining experience at Army Navy and especially, if it was free, a treat from a friend! Army Navy succeed on their mission, we came in hungry and we walked out happy! Mission Accomplished, Army Navy! Next story Certified Hottie: Buffalo’s Wings N’ Things! Previous story Something Local: My Bicol Food Trip! @Chyng, nako may trauma na ako sa abono! hehehe! @pinkc00kies, yup i love the classic burger, feeling ko di ko na kaya yung bully boy burger, sakto na ako sa single patty! Hehehe! hahaha! parang nagka-idea ako dun a. ilang bese na ba kong nagbook ng friends sa seat sale at wala man lang akong nakuha kahit isang kusing. Hindi ako nagenjoy dati sa Army Navy e. Once lang ako kumain. O baka dahil galing sa bulsa ko at nuknukan ng mahal? hahaha! Talagang "best things in life are free" isn't it? Next time I'll try steak quesadilla. Pag na-attain ko na ang goal kong pagiging malnourished.